Can you have a very slight overlap without violating the rule? Yes. This is not really an exception to the rule, but rather the manner in which the rule is defined. Elliott developed the wave theory using a close only price chart, not HLC or candlestick charts. Wicks did not come into consideration. Therefore, unless the price of wave 4 enters the body of the Wave 1 pivot, there has been no violation of the rule. This mode of interpretation may further be warranted given that trading is highly computerized these days and the enemy computers will clearly "gun" for the stops people place immediately inside of the wave 1 because of this rule. If W4 violates the rule that it can never overlap with W1, you must now re-label the waves so as to adhere to the rules and guidelines. Most importantly, you must do so in a manner that does not reflect any bias as to the direction you would prefer. What is the next most probable formation. Generally, this translates into what is the simplest formation. As with all wave counts, when selecting your alternative count, avoid grasping at the rare formations to form an answer. Yes, ending diagonals and triple Zigzags do occur, but you shouldn't immediately jump to the conclusion that it must be a complex or rare formations as your answer. You should always be forced into selecting one of the rare formations because nothing simple works. A 1-2 / 1-2 formed and you are in the second W2 rather than a Wave 4. It is an expanding ending diagonal in W5 - (W4 already terminated and you are in W5.) These are pretty rare, so not likely the probable answer. W4 is breaking into a double (W-X-Y) or Triple (W-X-Y-X-Z) Zigzag. A double and triple are pretty rare, therefore not the most probable explanation. It's not an impulse wave to begin with, but an A,B,C correction, and you are in WB retracement. Standard Stochastics (14) will tend to pull down to the Bullish reversal level, between 40 and 50. MACD will tend to pull down to do a ZLR (Zero Line Reversal), although that is much more common with Wave 4. Can you trade Wave 4? Sure, but there are a lot of good reasons not to. Complex corrections and triangles thrive in W4, so if you want to trade it you need to learn to ignore your indicators and be on your toes and prepared to hold on for the ride. 1. It is an Ending Diagonal, not an impulse wave. - If your wave 1,2,3 structure is not comprised of 3 waves each, reject this. 2. What you thought was waves 1-3 is actually an X wave. You are not in a motive wave at all but rather a complex correction. 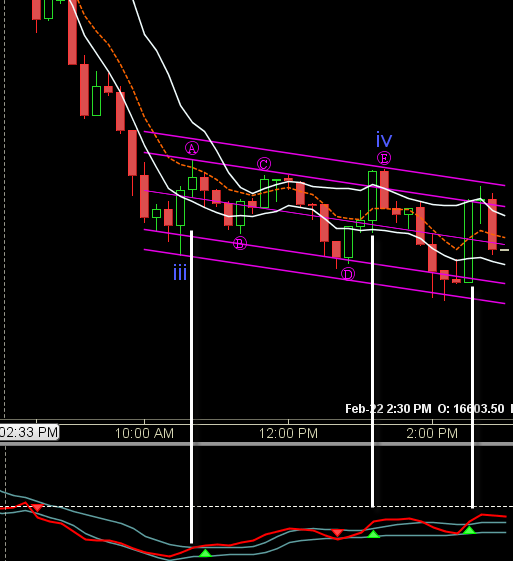 Your expected wave 4 is actually wave A of the Y leg of the correction. , you should immediately consider Waves 1-3 to actually be Wave X in a complex correction. The expected W4 is actually Wave A in the next corrective sequence and there is more counter-trend correction to follow. When W4 takes greater than 4x the time traveled in W2, it is far more likely that what you are labeling as W4 is actually W2 of a larger structure. Don't blindly accept a huge W4 when compared to a small W2.